My family is getting healthy in 2013, as one of our resolutions! To realize this goal, we are increasing our servings of veggies and fruits. 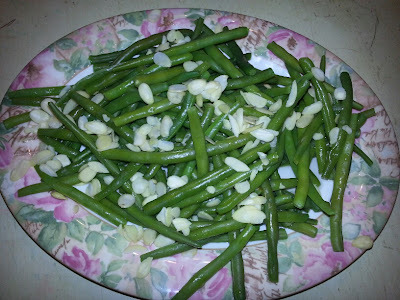 One such side dish that I recently served was green beans with lemon and slivered almonds! This dish is very low in calories, but packed with vitamins and minerals! This dish is inexpensive and quick and easy to make! More importantly, it provides a huge amount of nutrition in just a small serving. Green beans on their own provide a good source of vitamins K, vitamin C, manganese, vitamin A and dietary fibre. Lemons are a good source of folate, potassium, and vitamin C (you get a double dose of vitamin C here, as the green beans also rich in this vitamin)! Almonds are a good source of riboflavin, magnesium, manganese (you get a second dose of manganese, as the green beans also have this mineral), and vitamin E! 1.Cut off the head & tail of the green beans & then rinse all. 2.Drop green beans into a large pot of boiling water, reduce heat to a simmer. 3.Cook green beans for 10-15 minutes, until they are tender, but not soft. Drain & set aside on a serving plate. 4.Optional - toast slivered almonds on a cookie sheet for about 5 minutes, or until brown. Set aside. 5.Squeeze the lemon on top of the green beans. 6.Sprinkle the handful of slivered (toasted) almonds to the green beans as a topping. If you did not toast the almonds, you will be adding them plain. What do you think of my Grandma's Recipe? Would you try it? Brandi, is your daughter allergic to all nuts? I heard almonds are a member of the rose family - so my deathly allergic niece and nephew can actually eat almonds. The rest of the nuts are off limits though. This recipe sounds great. I love lemon and I love beans. I never thought to put them together. Paula, thanks for that awesome trivia about almonds being part of the rose family! I would have never guessed! That sounds great, and it screams summer. I'm going to try this. What a great combo! Would try this for sure. My daughter loves lemon on pretty much anything and I am sure she will love this. Looks delicious! Love any veggies with lemon juice. I made this for dinner on Wednesday night! It was sooo delicious, and my son had 3rds (score!). Thanks for sharing. Ingrid, I'm glad your family liked it! Thanks for trying out my grandma's recipe! I'm always looking for simple vegetable recipes that don't add calories by using cream sauces. This one looks delicious.